A loan of $6,000 helped fund trade show registration and the manufacture of sample products as a means of expanding the business and increasing revenue streams. After graduating from The Pennsylvania State University with a BS in Marketing, I worked for a start-up researching how emotions affected consumer behavior and decision making. While I enjoyed that work, I was really missing having a creative outlet. In my spare time I made artwork from papers and fibers, studied photography, glass blowing, and other artistic pursuits. Eventually, the pull to do creative work full-time was so great that I returned to school, this time to study graphic design. The opportunity to solve business challenges with visual communication suits my interests and strengths very well. I greatly enjoy the work I do with my business partners Brooke and Terry and our incredible clients. But after nearly eight years of custom design work, I am eager to stretch some different creative muscles, which is why I am pursuing a loan from the Kiva community. Further developing my skills as an illustrator and pattern designer will enable me to create a larger body of work, develop collections which can be sold and licensed, offer opportunities to expand my creative community, provide additional revenue streams for the business, and ultimately make me a better designer and business leader. It empowers a female entrepreneur to expand her creative design company. Curious & Co. Creative is a graphic design studio run by myself and two other women. Since 2010 we have worked with clients (many small business and a few large ones) to create engaging and effective visual branding. We've designed many logos, business cards, annual reports, websites, and product packages. We enjoy custom design work, but we are looking for a way to pursue other design passions while also creating revenue. Developing a collection of surface pattern designs will allow us to maintain an additional revenue stream and, after the initial time investment, will free up some of our time, allowing us to take on fewer custom projects. 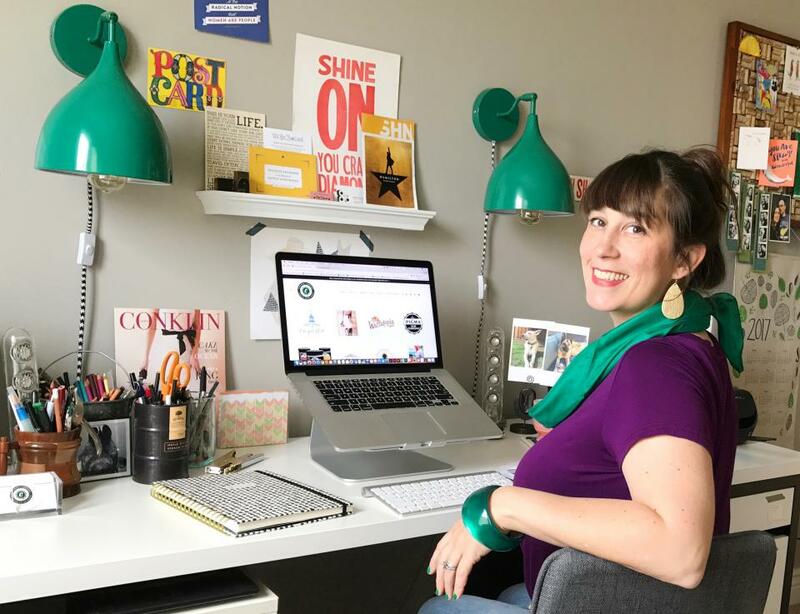 This year has been one of growth and change for Curious & Co. – I have shifted my role to focus more on marketing and brand strategy, my partner Brooke is participating in the Her Corner accelerator program, and my partner Terry has been managing orders of We the Postcard since we launched the line in February. With all of our refocusing efforts we feel confident that this next step is the right one for us and our business. In early 2017, we successfully launched We the Postcard, a line of patriotic postcards which encourage civic engagement. We've been able to donate 50% of sale proceeds to good organizations and this venture has inspired and motivated my partners and I to continue diversifying our revenue streams. After nearly 8 years in business focusing almost exclusively on custom graphic design work, we are interested in not only growing the business, but also expanding into more retail products, and licensing surface pattern designs (think: throw pillow fabric, curtains, wallpaper, stationery). A Kiva loan will help us sustain our business while we spend time designing a collection to market at the Blue Print Surface Pattern Design Show in May 2018. We plan to use a Kiva loan in the following ways: Show registration and travel: $2,600 Fabric print-on-demand services to prepare our new work: $600 Promotional mailers to buyers, licensing agents, and reps: $500 Marketing, promotions, booth design at the show: $700 Additional funds will be used to take classes and purchase illustration software and tools. Why are you endorsing Maggie? Maggie's creative drive is such a strength that this basis of the business is a strong contributing factor to their success and future success. Being in the business for 8 years focusing on custom work helped build their business and client base. Now developing another area of business by focusing on surface pattern design will bring in another revenue stream in a cost effective manner. Maggie and her team are a very focused group of individuals that have methodically planned their success. This is what will continue to grow their business. We at the Chamber are very confident they will also be successful with their surface pattern design work. Our Chamber is very committed to support businesses like Maggie's and will continue to support Maggie and her team as they grow.